For marketing to be successful in today's noisy world, you have to deliver the right message to the right place at the right time. If you want to convert your free-trial users into loyal customers, you need to start modeling your email communication after a similar strategy. This concept is known as lifecycle marketing. In today's post, we're going to look at specific stages in the buyer's journey where you can use content to activate and engage your trial users to increase free-to-paid conversion rates. See that trial CTA at the bottom? Bingo! 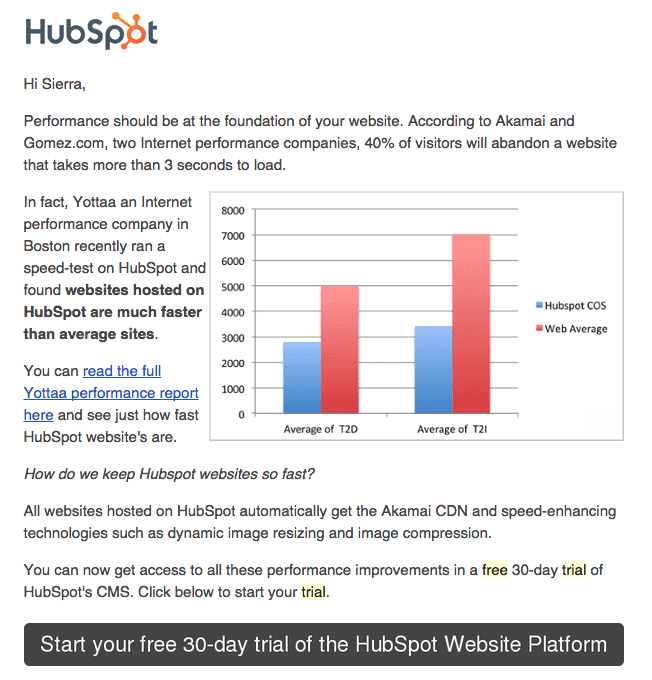 By providing me—the prospect—with valuable information that further educates me, HubSpot gains my trust and brand preference that may cause me to kick off a HubSpot trial over a competitor. Once a trial has started, activation is the name of the game. The goal is to illustrate your value proposition and to direct and encourage the user to begin to use the most valuable and "sticky" features of your product. This can also be referred to as a common conversion activity. There are a few key ways that content can be used in this setting. Start with a welcome email, which includes clear instructions on how to start using your product. In addition to directing the reader toward a CCA, this is also an opportunity to include links to a resource center and support documentation, as well as to provide additional information that might be valuable to your prospect at this stage. And if you just happen to have a content offer that helps illustrate the value of your key activation feature, then all the better. Once a user has been activated, you want to make sure he or she keeps coming back. Autoresponder and calling campaigns within a trial are great tools that can help you continue to engage with your prospects and educate them on both the problem that your product solves and the specific features they can use. Beyond this, content can be incredibly effective at converting customers over time. Just because a 14-day trial is over and the prospect hasn't made a purchase, it doesn't mean all is lost. Continue to engage your prospect with relevant content and use cohort analysis to analyze signups after the trial. 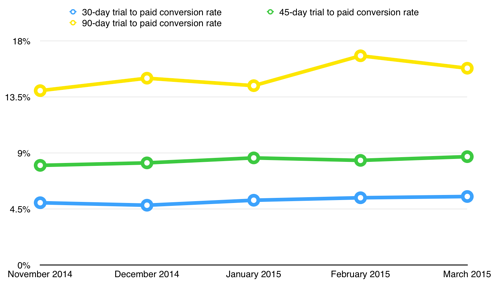 Take this example illustration from GrowthHacker Kit showing trial signup over time. Put some thought into how you can use content to engage your prospects in the 90 days after they've finished their trial. Great content gets shared, and referrals and evangelism are two of the most effective ways to grow a SaaS business. Jason Lemkin has argued that first-order lifetime value can underestimate true revenue generated by customers by 50–100 percent. By publishing great content and using it to engage your contact database consistently, you can increase growth via word of mouth and create second-order revenue streams, while also decreasing customer-acquisition cost. Just because you now have paying customers coming out of your free trial, some of whom are continuing to engage with you and share your content, doesn't mean you're done. Content can still be used to engage with users as a customer-success tool to help reduce churn and encourage up-sells and cross-sells. Don't just let content help drive leads at the top of the funnel. Content is too important and expensive an investment to not be used continually and repurposed throughout your entire funnel. Think about how each piece of content you create might also be used to engage a user in a blog post, a trial welcome email and social sharing. Looking at the entire ecosystem, not just the single asset, will open up additional opportunities to drive growth.